While we support Breast Cancer Awareness, there is another awareness we believe is needed which is the awareness of Prevention of Breast Cancer and knowledge of what actually causes Breast Cancer. Through this film, we hope to start the conversation about what we can do about PREVENTING BREAST CANCER. Billions of dollars have been raised through the tireless efforts of women and men devoted to putting an end to breast cancer. Yet, breast cancer rates in North America have risen to 1 in 8. "What's going on?" asks Barbara Brenner in Pink Ribbons, Inc. a new film now playing across America. This feature documentary visits some of the massive fundraising runs and questions where the money goes and asks 'who really profits from pink ribbon campaigns?'. Women with metastatic breast cancer from the IV League support group of Austin, Texas who openly tell us their stories. Pink Ribbons, Inc. looks at the pervasive impact of breast cancer fundraising. Every year, millions of dollars are raised, but where does all the money go, and what is actually achieved? The film offers a completely different take on the pink ribbon "success" story that has overtaken North America, with insight from leading doctors, activists and social critics, as well as women diagnosed with breast cancer. This film raises awarenes of PINKWASHERS. 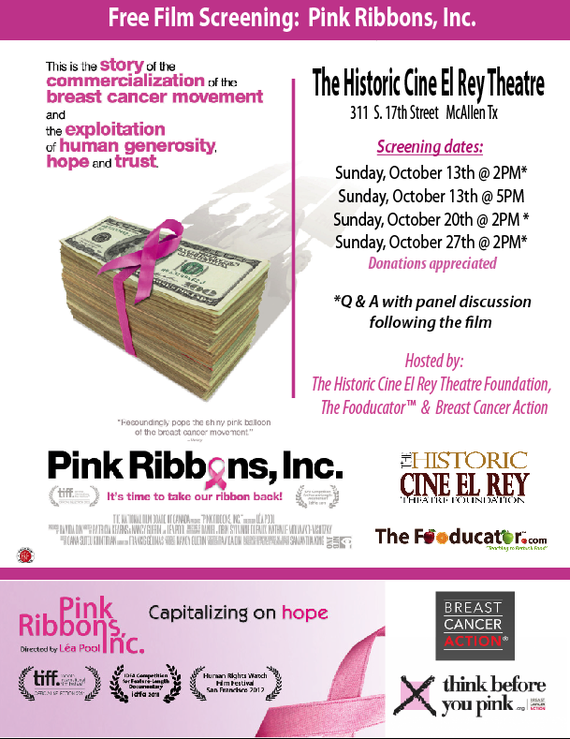 Hosted by The Historic Cine El Rey Theatre Foundation, Breast Cancer Action, The Fooducator™ and a group of ordinary people who care to raise awareness about PINKWASHERS and to help people THINK BEFORE YOU PINK®. Think Before You Pink®, a project of Breast Cancer Action, launched in 2002 in response to the growing concern about the number of pink ribbon products on the market. The campaign calls for more transparency and accountability by companies that take part in breast cancer fundraising, and encourages you to ask critical questions about pink ribbon promotions.